I was introduced to Pack for a Purpose on our November 2014 cruise. 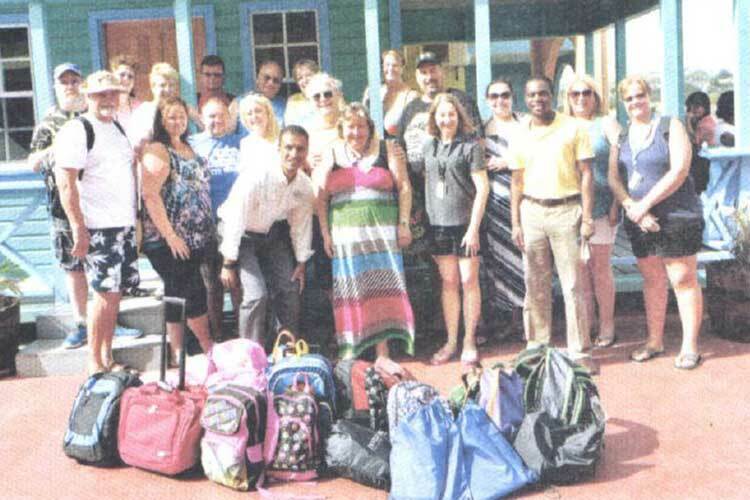 Another member of the cruise organized a group of us to bring school supplies—which we did. We then booked a cruise for May 2015, and I was the organizer. I provided fellow cruisers with information about the program and we had a small group of us take and donate about 300 pounds of school supplies for the children of Antigua. We also ordered the free soccer balls and were able to donate those as well. Kyle at the Sandals Grande Antigua Resort & Spa was very responsive and met us right at the port to donate, so it was easy to get off the ship and get the supplies to them. Note of caution, though—try to put all of your donations into one or two backpacks per person. We did have some of our group delayed for a few moments by customs because one person was carrying five bags. It was all cleared relatively quickly, but it caused some undue stress to people who were trying to help children. This is a great program and a way to help out those who are less fortunate when we are truly blessed.